Hubby said when snapping my pics this morning "you look very 70's, but in a good way!" 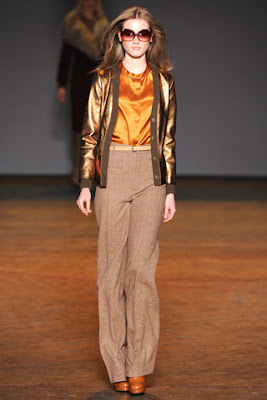 With the return of flared pants, saturated colors, recent runway shows, the 70's have staged their comeback. I think that for me to feel appropriately 70s in these photos, I needed to stand in some heated orange-yellow sunlight with aviators on my face and wind tousling my hair. Where's my staged wind?! Pffft! I actually think anytime I wear this cardigan it's a 70s throwback. Or perhaps it's my brown and tan color scheme here? The ruffles and pants themselves don't feel inherently 70s and the pin feels much more 50s-60s to me. My friend Jeanny didn't get the 70s vibe from this outfit tho, so maybe Ev is just trippin'. Actually, looking at this outfit, I think there might be too much going on with the ruffle AND the bow on the pants. What do y'all think? By the way, I do love how my polka-dotted sleeves extended beyond my cardigan sleeves. I don't always mind when cardigan sleeves aren't full length because, I really like having my cuffs peek out. I think this is especially nice if there's a nice contrast between the shirt and the cardi. I hope y'all have a lovely President's Day Weekend. Buddie's radiation appt was rescheduled for next weekend, so I'll be staying home doing some data analyses for a presentation next week! them's some good thrifting! That blouse is awesome- I love the polka dots at the wrist. I often end up having to roll the sweater sleeves to get that effect!